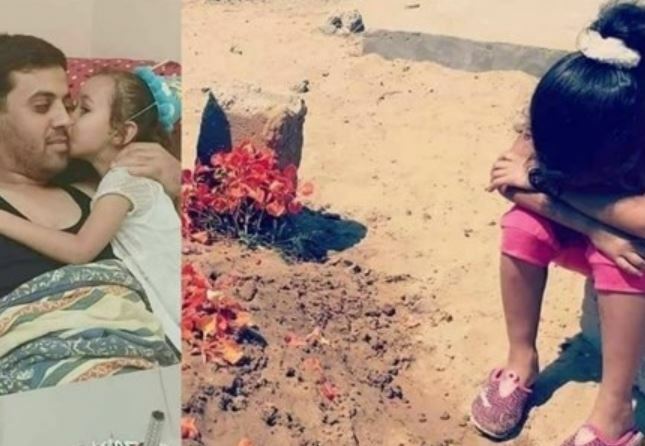 The heartbreaking picture of Ritaj, the little girl, the orphaned child, next to her wounded dad, celebrating her sixth birthday with her dad, from his hospital dead, shortly before he succumbed to serious wounds after being shot by the Israeli soldiers, became her last picture with him, and now her picture spreading around the Internet, is of her sitting and crying next to his grave. Social medical activists in Gaza shared the pictures widely, and led an initiative aimed at trying to pay the financial dept the family of the slain Palestinian, Mohammad Hamada, is facing after his murder by the Israeli forces. Hamada was shot during the ongoing nonviolent “Great Return March” processions along the Gaza border, and suffered a very serious injury that eventually claimed his live. Ritaj had no idea that her picture with her father on her birthday, on June 4th, would be the last, did not know he is going to die from his wounds just a few days later, taken from her by a heartless Israeli sniper, hiding like a coward, a silent criminal, a terrorist stationed hundreds of meters away, and aiming his scope, his bullets at unarmed protesters. He took her father away from her, forever, in a heartless cold-blooded, cowardice murder, and with his bullet of hatred and terrorism, made that picture, that moment, the last time, the last memory of the child with her beloved father. 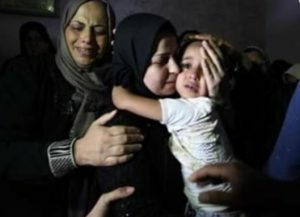 The story of Ritaj, the murder of her father, broke the hearts of activists in Gaza, and around the world, who started sharing her pictures with her father, and next to his grave, all over Twitter and other social media outlets, leading activists in Gaza to come up with an initiative aiming at trying to repay the debts the poor father left behind. The Maan Palestinian News Agency said the initiative, named “Forgive and be rewarded” (by God) aims at getting merchants and lenders to erase the debts of many poor families, especially the families of Palestinians slain by the Israeli forces, and was successful in removing many of these debts, and still ongoing with its set goal. 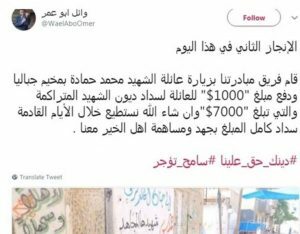 Initiative organizers managed, so far, to pay $1000 of the dept Hamada’s family is left with, and is determined to eliminate all their debts, of a total of at least $7000, activist Wa’el Abu Omar said. So many merchants have already started voiding all receipts and purchases of many families, who had to go into dept to feed their children, amidst the deadly Israeli siege and dangerously-increasing poverty rates in the coastal region. Ritaj lost her father; this is a fact that will never change. She lost her security, lost a big portion of her heart with him. “Father, please do not leave… I am still very young, and I want you to celebrate all my birthdays with me, even from your hospital bed, every year, just stay with me…” this was a wish of this orphaned child as portrayed by Journalist Imad Eid in one of his Facebook posts, commenting on her picture with her dad, celebrating her birthday, for the last time, with him. Death is something that no human enjoys; families prefer their loved ones alive, even on a hospital bed, visiting with them, and loving them, rath er than visiting their graves. His statement is as sad as it is true, it is just one of the countless of stories of Palestinians killed by Israeli soldiers, including the 120 who were killed since Palestinian Land Day, on March 30, and with more than 13.000 injured, dozens still facing a looming death, the only thing that remains is their memory, as they live on in the hearts and minds of their families, and the steadfast and determined Palestinian people, struggling for their liberation, independence and the Right of Return.